Prizewinning organist Daryl Robinson is quickly emerging as a solo and collaborative artist, praised for his innovative programming, impeccable technique, imaginative registrations, and unique depth of interpretative skill. 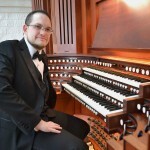 A recipient of the First and Audience prizes at the American Guild of Organists 2012 National Young Artists Competition in Organ Performance, he also received First Prize at the 2009 William C. Hall Organ Competition (Undergraduate Division) and a fellowship to the 2007 Summer Institute for French Organ Studies. A Houston native, he is currently pursuing a Master of Music in organ performance at Rice University as a student of Ken Cowan. He holds a Bachelor of Music from the University of Houston, where he studied organ with Robert Bates, harpsichord with Matthew Dirst, and choral conducting with Betsy Cook Weber. He has also worked extensively with David Higgs of the Eastman School of Music. Mr. Robinson has performed throughout the United States and in Austria, the Czech Republic, France, Hungary, and Wales. He has appeared with the Grammy-nominated ensemble Ars Lyrica Houston, the Houston Symphony, the Houston Chamber Choir, Mercury Baroque, and the Immanuel and Helen Olshan Texas Music Festival Orchestra. He has performed under world-renowned conductors including John Rutter, Carl St. Clair, Mei-Ann Chen, Anton Armstrong, and Mack Wilberg. 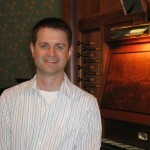 Mr. Robinson serves as organist and artist-in-residence for South Main Baptist Church, Houston. His commercial recording Sempre Organo is available on the ProOrgano label, and As you set out for Ithaka: Music by David Ashley White) on the Albany label. Robert Nicholls was born in Cambridge, England to a British farmer and American mother from Carmi, Illinois, and grew up in rural Cambridgeshire. At age eight he joined the choristers at Westminster Abbey in London, under the direction of Simon Preston. He graduated from the Oundle School and Cambridge University. He was a member of the choirs of the Gonville and Caius and the St. John’s colleges, Cambridge, where he sang tenor. He maintained an abiding interest in the organ and joined the staff of First Presbyterian Church in Evansville, Indiana, in 1996. He plays piano and directs the band at Wide Awake Worship, and at traditional worship, in the sanctuary, directs the choir and hand bells, and plays the C.B. Fisk pipe organ, Opus 98. His organ teachers have included James Parsons, Philip Scriven, Roberta Gary, and John Schwandt (improvisation). Mr. Nicholls’s compositions for both organ and choir have been performed and broadcast in both the United States and Europe, and at Royal School of Church Music (RSCM) America summer residential courses. 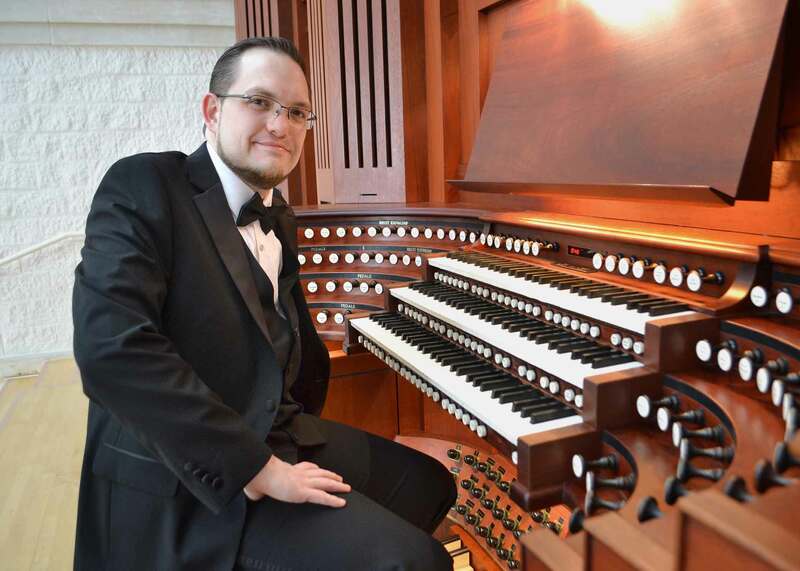 He enjoys accompanying silent films, and won first place in the American Guild of Organists 2012 National Competition in Organ Improvisation. 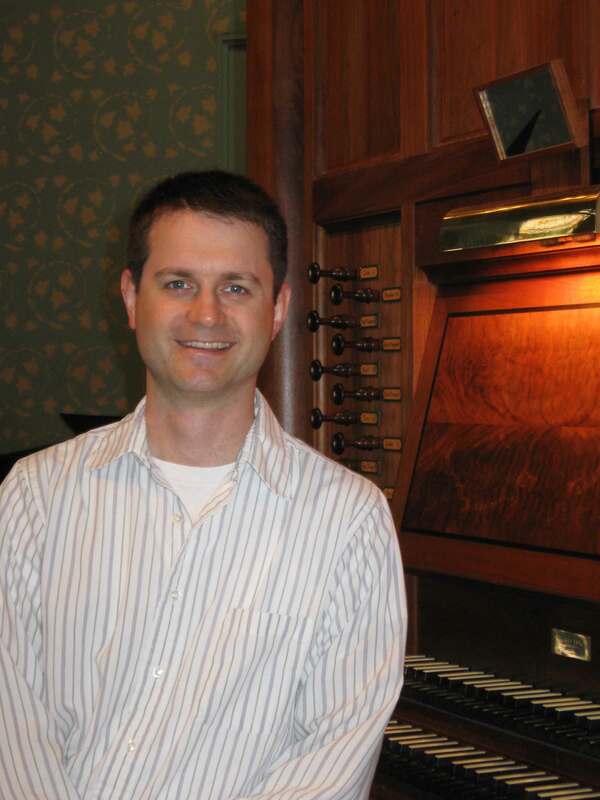 He is also a strong supporter of RSCM America, serving as Houesmaster and organist for summer residential courses. He is in demand as a leader and clinician for choral festivals nationwide. Mr. Nichols is married to Emma Nicholls, Ph.D., a pediatric clinical psychologist. They are the proud parents of Elena, age nine, and William, age six.